Imagine a group of 11 girls signing up for a program where you live in the wildness for one month. During this month you are expected to cook and sleep outdoors with kids you have never met before. This is not like some other camps where you have your cell phone or MP3 player. In this camp, you hike only with your most necessary belongings and your camp-mates. During the first week, you do not really "get" what is going on. You feel like you just landed from outer-space into a world where everything is different. You are tired by 8:30 pm. Every morning you wake up at 5:00 am to daven (pray). After davening (prayers), you discuss a part of the prayers and then you start to hike and hike. During the second week, you start appreciating and having fun with what you are doing. 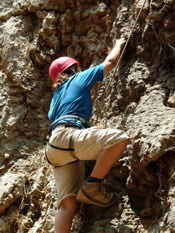 You go rock climbing. While doing so you learn to conquer your fears, be brave, and to stand up and continue after you slip. There is no such thing as "giving up". You do not have any choice in the matter. You must reach your goal. Your goal is the amount of kilometers that you must reach for the day. Shabbat is an amazing experience. You make all the food on Friday, dig a hole, bury the food (to prevent rotting), and make an eiruv (string around the campsite). By the time you are done preparing for Shabbat, it is time to light the Shabbat candles. Kabbalat Shabbat (welcoming Shabbat services) is beautiful. You sing in the dark and daven (pray) out loud with the voices of girls joining together in perfect harmony. You eat in the dark, clean up and head down to your tents. Shabbat day is a little different. You daven (pray), learn the parsha (weekly Torah portion), and have your meal. After that you play bonding games that are amazingly fun. Then you have Seudat Shlishit (third Shabbat meal) where the girls join together to teach each other new songs. I experienced all this on the Israel Trail Teen Adventure summer program. My favorite part of the program was the desert trek. 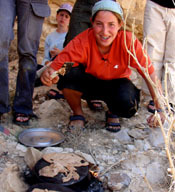 I loved learning how to make laffa, which is large pita, chatzilim, which is a roasted eggplant dish, and Bedouin bread made in the coals of a campfire. We also learned how to make soap and ropes out of plants. I also enjoyed feeding the camels as well. I loved sleeping under a brightly lit sky. The sky was the most amazing thing in the world. Only a person without electricity or city lights could truly see the galaxy, Milky Way and billions of stars in the sky. Sleeping without a tent/roof over me was probably the best experience of my life. I recommend Derech Hateva's ITTA program as your summer camp. At Derech Hateva you grow as a person while having the time of your life.